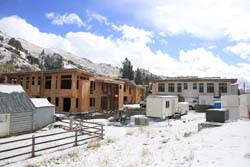 A 15-unit rental housing complex under construction south of Ketchum and scheduled for completion this spring will likely be the first completed within Blaine County’s Community Housing Overlay District. The district was put into effect to increase the inventory of affordable housing in the Wood River Valley. Cold Springs Crossing is being developed by Rich Wendling of CK Enterprises. It contains five income-restricted housing units that will be available to qualified applicants on the Blaine County Housing Authority database. The five units will be for people making an as-yet-undetermined percentage of area median income. The other units will be rented at market rates. “There’s already a waiting list for these units,” said Housing Authority board member Heather Filgate. The complex is within the McHanville area, between state Highway 75 and St. Luke’s Wood River Medical Center, an area that county officials have wanted to revitalize for years. Because it is also within the county’s Community Housing Overlay District, the developer is required to provide deed-restricted units in exchange for increased density. The five deed-restricted units will have income-based rents, ranging from $545 for a lowest-income-level three-bedroom apartment to $861 for a highest-income-level one-bedroom. The units range in size from 777 square feet to 1,463 square feet. A comparable, new 24-unit rental housing project on River Street in Hailey, restricted for rent to seniors, was filled when it opened last spring, and now has a waiting list of new applicants. The River Street project was completed by the ARCH Community Housing Trust. “In general, the demand for rental housing is increasing in the valley,” said ARCH Executive Director Michelle Griffith. The three buildings that make up Cold Springs Crossing feature solar-powered radiant heating of floors and domestic hot water, gas fireplaces in each unit and covered garages and storage areas. Cold Springs Crossing representative Marc Reinemann said Wendling had two purposes in developing the site. “We bought a property [that was] under duress, about one acre, just before foreclosure. The cost per unit per acre is extremely low,” he said. Reinemann said the county’s housing overlay brought down the cost per unit. “By increasing density on the lot from two to three units up to 15 units per acre increased density, which lowered the cost per unit on the land,” he said. Cold Springs Crossing architect Michael Doty said the building will meet national green building code standards, and expects the design to attract long-term tenants. “We tried to design a project that’s going to be a nice place to live—to exceed expectations,” Doty said.